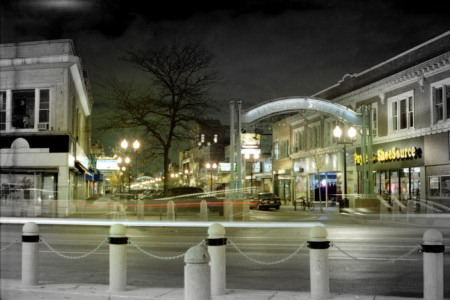 There is much, much more to Lincoln Square than beautiful real estate! If music, food, shopping, cocktails and nostalgia are up your alley, you must visit Lincoln Square. Opinions are strong as to which neighborhood(s) should be called Lincoln Square, but in my opinion, Lincoln Square encompasses the sub-neighborhoods of Ravenswood Manor, Ravenswood Gardens, Bowmanville, Budlong Woods as well as the actual neighborhood of Lincoln Square. The Chicago 77 and its 200 sub-neighborhoods make for a much longer story than I can share here. The historic heart and soul of the Lincoln Square rests in the ‘square’ formed by Lawrence, Western and Lincoln Avenues. Quite a few of my clients have recently purchased real estate in Lincoln Square and say it is a lot like living in a small town within a big city: bustling streets with local shops, restaurants, and bars are just a mere minute walk from the charming homes that sit on the quiet, tree-lined streets. What kind of real estate will you find in Lincoln Square? Brick and stone, two and three-flat buildings make up the majority of the landscape. Still, some homes boast expansive porches and sizeable balconies, and a few bungalows can be found along these streets. Overall, values are up 10% from 10 years ago, though that does not reflect the recent and exploding market of expensive single homes priced well above $1 million. Prices for condos and homes in Lincoln Square range from $50,000 for an entry level, ‘needs work’ condominium to $2.5 million for a custom, extraordinary single family home. If you’re searching for a realtor who can help you navigate all that Lincoln Square has to offer, I’d love to help! You can search current Lincoln Square real estate listings below. Give me a ring or shoot me an email, and let’s start searching for that dream home of yours! If you’d like to know more about Lincoln Square or scope out other neighborhoods in Chicago with a top buyer’s agent, let’s chat! You can also scroll down to see current Lincoln Square real estate listings. I look forward to hearing from you! Let’s find your dream home, shall we? Looking to sell your home in Lincoln Square? Call me to talk about how the #1 brokerage firm in Chicago, and one of its top listing agents (me! ), can help you stage, price, market and sell your home for maximum value. It's never too soon to begin; preparation to list time can range from 14 to 120+ days, depending on how many closets there are to purge.